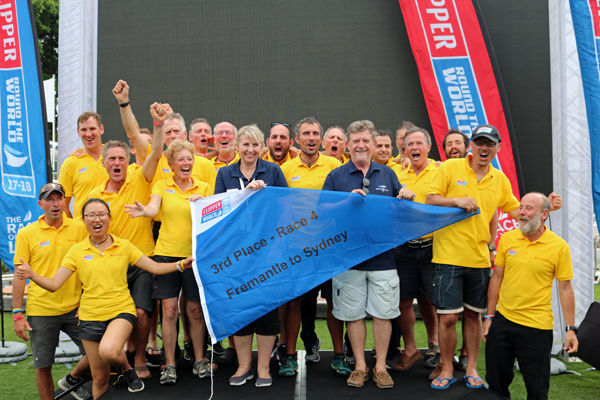 It has been a thrilling first stage of the All-Australian Leg of the Clipper 2017-18 Race and the fleet came together to celebrate the achievements of Race 4 at a rapturous Prize Giving ceremony at the Cruising Yacht Club of Australia (CYCA) in Sydney. 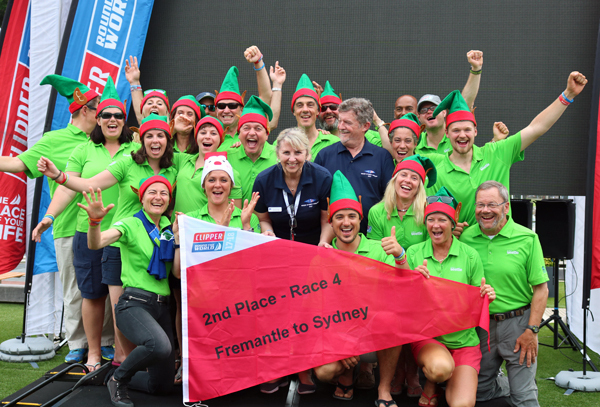 Over 450 of the Clipper Race family were greeted to The Rolex Sydney Hobart Yacht Race Village at the CYCA with crew, skippers and supporters with a soulful summer soundtrack and drinks reception ahead of a welcome address from CEO of the CYCA, Karen Grega, and Commodore John Markos. Race 4: The ClipperTelemed+ Tasman Test has featured some of the closest ever Clipper Race finishes that kept Race Viewer addicts on the edge of their seats throughout and a sensational home town victory for Sydney Skipper, Wendy Tuck, on board Sanya Serenity Coast who claimed the maximum twelve points. The winning skipper and her crew took to the stage to collect their 1st Place pennant as a congratulatory message from the Vice Mayor of Sanya, Xu Zhenling, was read out to the warriors of Sanya Serenity Coast: “I would like to extend my warmest congratulations on your great win of Race 4. Over the past months led by Skipper Wendy, you have been sailing across the Atlantic Ocean, across the Equator, through numerous tough tests. “Your outstanding achievement has shown the spirit of Sanya and the charm of the Clipper Race. I am sincerely proud of all of you. All the Sanya people are proud of all of you too. For the first time in Clipper Race history, it was a female Skipper one-two with Clipper Race Skipper, Nikki Henderson, and her Visit Seattle crew finishing just seventeen minutes behind the winners. 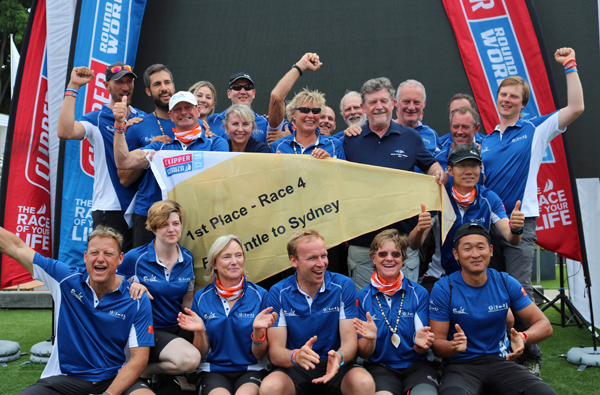 The team were led up to the stage by Nikki to claim the 2nd Place pennant, the team’s first podium position, and her efforts were praised by the winning Skipper, Wendy Tuck, who said: "I don’t like bringing the whole women in sport thing up because I’m a sailor, I like sailing with people. But sometimes you’ve got to go, 'yeah, we’ll take that one'. Nikki is an amazing sailor. She’s 24 years old and she’s second and it is fantastic for her." It was also a maiden podium place for the overall race leader, Qingdao, with Skipper Chris Kobusch and crew collecting the 3rd Place pennant. The sailing conditions on this race have been extremely varied from fast downwind spinnaker sailing conditions to a hard, upwind slog to Sydney. 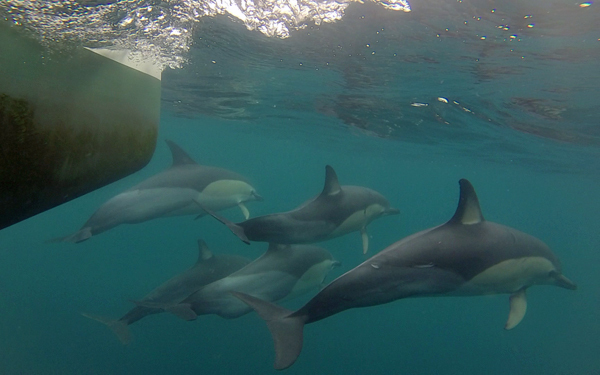 And while negotiating wind holes, the onboard crew have also been able to capture some of the spectacular wildlife on display with Garmin crew member Gerardo 'Jerry' Injoque taking home the Henri Lloyd Photo Competition prize for his stunning photo taken on a Garmin VIRB Ultra 30 of a pod of dolphins playing around the bow. 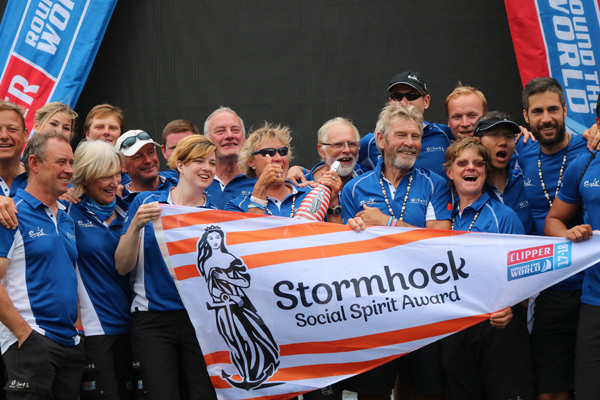 Skipper Wendy Tuck said that the award had come as a complete surprise but was greatly appreciated: "It's so important to the team as we’ve had so many good results so far, but we’ve also lost races, so just for the crew to keep pushing and just keep trying and never give up - that’s what my team did, they never gave up. To win the Social Spirit Award really does make a difference as it shows that that there are so many people behind us and supporting us." Race 4 marked a huge milestone for the Official Charity Partner, Unicef, as it was announced that over half of the fundraising target of £400,000 has already been raised by the Clipper Race family before the fleet is even halfway around its eleven-month circumnavigation. The total raised so far for this race is £206,896.21 meaning that more than half a million pounds has been raised for Unicef since becoming a partner ahead of the Clipper 2015-16 Race. In the Scoring Gate challenge Qingdao kept up its record of scoring bonus points in all races and was the first team through for the third time claiming three bonus points once again, Visit Seattle getting two and Sanya Serenity Coast took the final bonus point. In the closest Elliot Brown Ocean Sprint of the Clipper 2017-18 Race edition, an incredible THIRTEEN seconds separated the top two teams with Sanya Serenity Coast claiming a further three bonus points and Visit Seattle getting two points. Just three minutes 16 seconds separated the top three teams with Qingdao taking the final bonus point. And just when you thought finishes in sailing couldn’t get any closer, it was confirmed at the Prize Giving Ceremony that the Race Committee has decided that yesterday’s battle for eighth place in The ClipperTelemed+ Tasman Test between GREAT Britain and Nasdaq was deemed to be a tie.